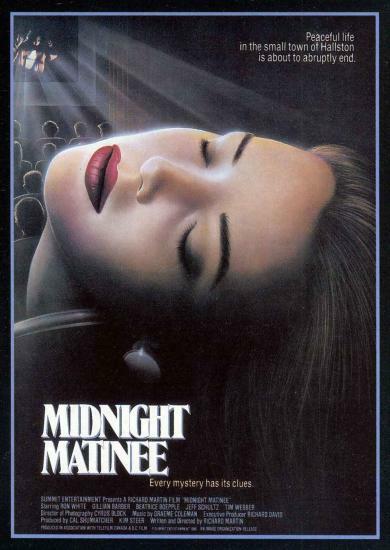 (AKA Midnight Matinee) 1988, Starring Ron White, Gillian Barber, Jeff Schultz, Beatrice Boepple. Directed by Richard Martin. 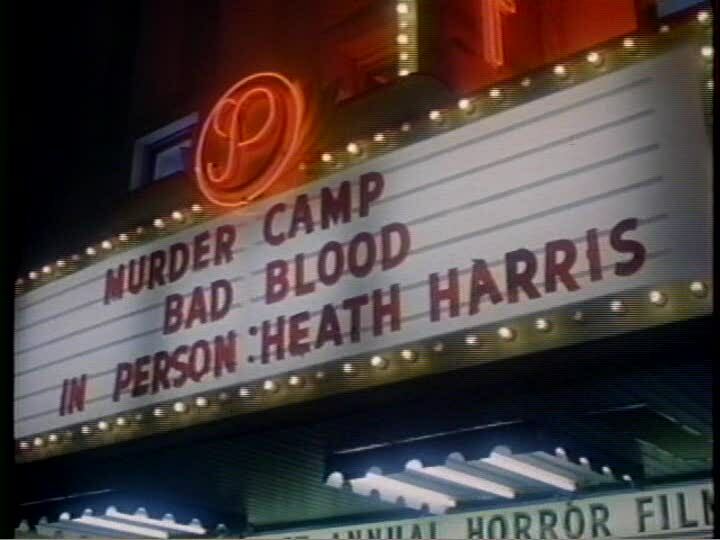 Not to be confused with Joe Dante 1988 film Matinee, a film with which Richard Martin's horror effort shares several similarities, Matinee begins at a horror movie festival at the Paramount theatre in Holston, BC, where they are showing Murder Camp and Bad Blood. During the first film, we see a couple of teenagers doing what teens do best in the back of dark theaters. Suddenly, the girl looks up to watch a character on screen get a knife through his throat. When she turns back to her boyfriend, she screams he has somehow been killed in exactly the same way. All of a sudden, it's "two years later." After being closed since the fateful murder, the Paramount theater is reopening with, you guessed it, another horror movie festival. Scared guests are slated to see the films No Escape, Death Sentence, and a silent film from long ago, Sleepwalkers. The highlight of the festival promises to be the premiere of Bad Blood 2, with a special appearance by the director Heath, who originally grew up in Holston. Not everyone is happy about this grand reopening. Fearing more deaths, anti-horror film letters have been pouring into the Holston police department. And it's up to Allan, the new cop in town, to sort through the piles. The employees at the theater are also nervous, but for other reasons. The hard drinking owner Mr Gardner doesn't want the others finding out that he is living with Warren, the fey ticket collector. The projectionist Marilyn, once married to Heath, is nervous about her husband her coming back to town after 13 years. He convinced their eldest daughter to live with him in Los Angeles a few years ago, and now Marilyn is afraid that he wants to take away their other daughter Sherry. Sherry has problems of her own, too. She is dating Lawrence, reckless teen hoodlum with a heart of gold, but is constantly pursued by Bob, reckless teen hoodlum with a heart of stone. After beating up Lawrence and professing his love for Sherry, Bob ends up with a rope necktie behind the movie screen one night just as a hanging scene of Sleepwalkers plays to an empty theater. Off of the letter answering beat, Allan soon shows up to investigate Bob's murder. Meanwhile, Heath appears in town and makes it clear to Marilyn that he wants Sherry to come and live her sister. But when he goes out on stage to premiere his movie, the lights begin to flicker on and off, and he is brained from behind with a crowbar. He regains consciousness just in time to realize that he is behind the screen with a metal chain around his neck. And, you guessed it again, just as the character on screen dies, so does Heath. Soon, Sherry's sister Kelly shows up in town and Allan discovers that it was Kelly writing those letters of protest because she was the girl who saw her boyfriend killed two years ago. From here, the film works overtime to set Warren up as the most likely suspect, which of course means that he is innocent. Warren manages to go missing at key plot points, and after Warren breaks up with Mr Gardner, the owner is beaten to death while watching horror movie previews on a small TV in his office. Things heat up as Bad Blood 2 is finishing on the screen upstairs, with Allan and all of the remaining suspects running around in the basement under the theater. 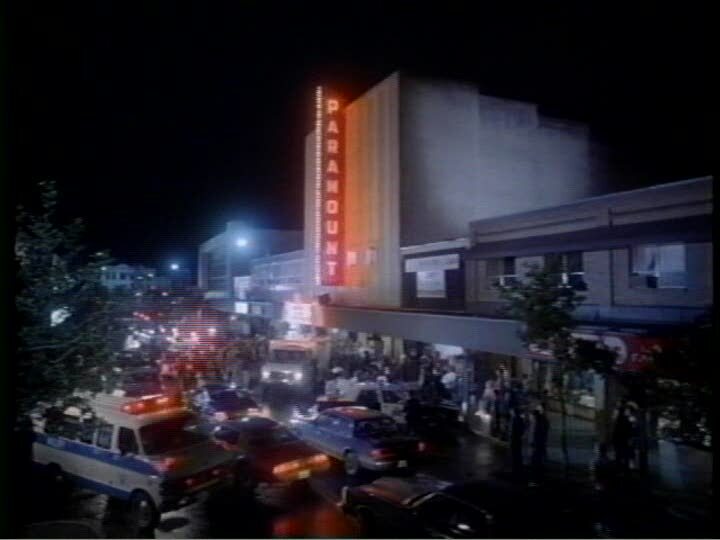 More of a murder mystery than a true horror film, Matinee seems to be trying to create a more realistic kind of horror compared with the over-the-top slaughterfests pictured on the screen of the Paramount theater. It didn't escape my attention that the films in the festival are, for the most part, traditional Hollywood slasher horror films. The horrific elements of Matinee are directly contrasted against the slick, glorified American versions. While the deaths in Matinee's interior movies often cause the theater audience to laugh, the actual killings by the mysterious Holston killer are not so humourous for us to see. Is this the director's way of creating distance between the increasingly campy American slasher genre and his own horror film? 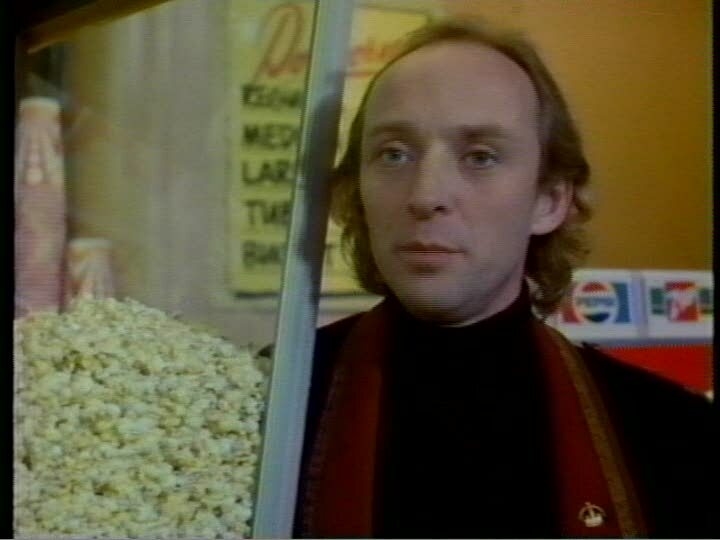 This is not to say that Matinee doesn't have it's share of problems: the detective character of Allan is not particularly effective, the surprise ending isn't much of a surprise, and the film is unable to maintain a convincing horror movie ambiance. Despite this, Matinee is a consciously Canadian film (there's even a poster for Pin: A Plastic Nightmare in the owner's office), and technically, it is a fairly accomplished looking movie that has some effective scene transitions. A better than average stab at the " whodunit?" horror style seen in other Canuxploitation films such as The Amityville Curse, and Happy Birthday To Me.